Please find below a CELEBRITY DIALOGUE INTERVIEW with the award winning writer / director / producer / cinematographer and artist BERNARD SALZMAN, with whom I’m collaborating on a screenplay and movie of my first novel, VELVET TOTALITARIANISM. BERNARD SALZMAN has collaborated on over one hundred and sixty projects, including documentaries, features, TV Movies and reality TV world wide, for such clients as: BBC, PARAMOUNT, UNIVERSAL, FOX, ABC, CBS, HBO, SHOWTIME and many others. His companies INNER CIRCLE FILMS and EYE OPENER FILMS, are full service production companies, able to provide production and post production services. Bernard had the honor of being nominated for the Emmy award for a TV movie he made for CBS. CelebrityDialogue: Did you have formal education in cinematography and production or did you learn by doing? Bernard: I attended film school where, since I had previously majored in Art, I concentrated in Cinematography. CelebrityDialogue: How did you enter the entertainment industry? Bernard: Because of my art training, after graduation I was offered to shoot and direct a series of documentaries about prominent artist – ended up doing 35 films in that series. One of them received a special critics award at a film festival in Stockholm. CelebrityDialogue: When and how did you establish Eye Opener Films? Bernard: Eye Opener Films was established in 2007, as a secondary production company dealing mainly with the development and production of feature films. My other company Inner Circle Films, produces mainly commercials, documentaries and reality TV. CelebrityDialogue: Tell us about your documentaries that you produced and shot? Bernard: I started my career as a filmmaker, doing documentaries. As I mentioned, I did the series abut artists and following that was hired to collaborate on documentaries dealing with various subjects – archeology, social and political subjects, religion and many others. It became increasingly difficult to fund and market documentaries in the 80’s and 90’s, therefore my work concentrated more on features, TV movies and commercials. But I always had a soft spot for documentaries and when the opportunity presented itself, I was able to do one of my favorite documentaries – Vegas Striped. It documents the rise and fall of a young man who, after overcoming a traumatic childhood, is able to become a very successful business man, only to loose it all to his gambling addiction. CelebrityDialogue: Which major commercials have you done? Which corporate clients have you worked for? Bernard: I have done numerous commercials in Europe and the US. Clients included: Nike, Sony, Pepsi, Kodak, Allstate, M&Ms, BMW, Porsche, Rocawear, and so many others. CelebrityDialogue: What about your work in features? Which major production houses have you worked with? Bernard: I had the opportunity to work for major studios and independents alike. Disney, HBO, Showtime, CBS, PBS, Fox, Paramount, MGM. CelebrityDialogue: Which reality TV shows have you been involved with? Bernard: I have developed several reality TV shows starting with a show called Man vs Vegas for CMT. Other shows were Raising the bar, The prodigy and recently, At the Pawn Shop. CelebrityDialogue: Which project got you nominated for the Emmy award? Bernard: It was a TV movie called My past is my own for CBS – it was about the civil rights movement. CelebrityDialogue: Which other awards have you won? Bernard: I received two Best Cinematography awards, a Gold Telly award and a Shine media award. CelebrityDialogue: Tell us about Love, Blood and Tears. Bernard: Love Blood and Tears is a project about the Lincoln brigades and their involvement in the Spanish Civil War. These volunteers from all walks of life went to Spain to fight against and prevent the rise of Fascism. Many famous artists have taken part in this, including George Orwell, Hemingway and many others. CelebrityDialogue: Which other projects are you working on currently? Bernard: I am trying to raise funds for a feature film that is very dear to me, based on a script and short story I wrote called Mihaella. I have also developed a web based show called Divorce Rehab – I am currently in production with it. The title of this fantastic novel may stress its historical concerns, but don’t be deceived: it is a riveting, suspenseful story replete with compelling, richly developed characters with whom you become intimate quickly, and whose predicaments immediately capture and concern you. Moscovici is a great writer: she is tackling many themes in this ambitious book, but the story itself, which draws you in from its opening pages and consistently builds intensity every step of the way, is always front-and-center and leaves a memorable impact. Moscovici writes so intimately that you feel as if you’re in the story with her characters, not reading it. This is an unusual, exciting sensation, and a mark, I suspect, of truly great literature. I can’t recommend this novel highly enough. Claudia Moscovici’s novel has everything to excite the reader on both rational and emotional levels. Political thriller, love story, testimonial of resistance against all the possible odds! Moreover, it is about love and the way to freedom–imperfect maybe, but better than the concentration camp that Ceausescu’s Communism planned to perfection in Romania. All these are transmitted through the literary writing, not like in a newspaper or a history book. Modulation between real life and imaginary, characters who emotionally convey the message, outstanding descriptions and dialogue make this book an outstanding novel! There are very many versions of Romanian history, especially when dealing with the events leading up to the Romanian Revolution of 1989. So much happened, in fact, during the closing days of communism in Eastern Europe, that there is no one story of how it happened. This novel powerfully represents one scenario. This fictional account, where the author even gave the dictator Nicolae Ceausescu the maiden name of his wife Elena Petrescu (perhaps to emphasize who the real power was in the country), is a story of how love can have many twists and turns in a society living in constant terror of the Securitate (secret police). Even though the state managed to force people to do things they wouldn’t normally do, love finally emerges from the thorns of communism … and the people carry on with their lives. There are numerous theories about how the Revolution of 1989 started, including the premise proposed in the novel that the CIA played a part. Whether or not this scenario is true is immaterial. The novel is a moving picture of how it might have happened. I felt sad when the book ended because I wanted to hear more about the characters. I can only hope there’s a sequel. This beautifully told story of a family’s struggle to stay together is very moving. Interwoven with the narrative is an intrigue between a secret service operative for and a woman forced to trade her body in exchange for the welfare of those she loves. It’s a complicated, beautiful story which sheds light on an oppressive regime. Before reading this book, I was totally unaware of the human rights oppression committed against the people of Romania. Through this lovely story of a family’s struggle, I saw a daily life in all its joy and horror. Well written and extremely moving. A beautifully written and very entertaining novel with characters who always feel real to the reader, it is at the same time a fascinating account of life in Romania under the Ceaucescu regime, a taut thriller, a poignant description of immigrant life in the US and a moving love story. Yet, it is never really sad or depressing. Ultimately uplifting, it provides a lot of laughs throughout. Claudia Moscovici creates a vivid portrayal of the lives of ordinary people living in totalitarian Romania. Cold historical facts and figures tend to leave us emotionally indifferent. The impact of a nation’s tragic events on one single person or family is much better understood and more profoundly felt. And this is what makes Claudia Moscovici’s book so very special. Her novel, Reincarnation of Love, is prefaced by Velvet Totalitariasm, a very well researched history of Romania under Communism. Depending on one’s point of view, Moscovici’s work could be considered as the fictionalized story of a real Jewish-Romanian family under Communism, based on her own recollections and that of her family, supported by true historical facts; or a brief history supported by the fictionalized story of a real family. It’s a book well worth reading. The novel is a page turner, it’s witty, well written, and includes some touching portrayals of immigrant life in the United States as well. Claudia Moscovici’s first novel treats the intersection of politics and family, transporting us deftly in time and space. Depth of knowledge–and experience–is felt on each page as conflict, struggle and spirit come alive through Moscovici’s engaging prose. Highly recommended! 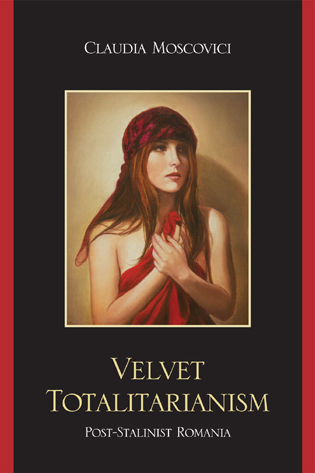 Velvet Totalitarianism could be best described as a comic epic. This enjoyable novel tells the story of a family struggling to survive the repression of communist Romania during the Ceausescu regime.It has the ambitious range and tragic elements of an epic, while also being filled with touching anecdotes and humor: the laughter through tears kind that Eastern European writers are known for.This novel has it all. It’s a story of survival that will move you, entertain you and inform you. My first novel, Velvet Totalitarianism, took me about ten years to write. It took me so long partly because I wrote this book while also teaching literature and philosophy, writing scholarly books and raising a family. It took me a long time to write it also because I had to do a lot of historical research for it. When one works for so long on one book, the interrelated questions of motivation and intended audience become all the more relevant. As I was writing Velvet Totalitarianism, I asked myself often: why write historical fiction about the Cold War, an era which is now relegated mostly to history books? Why is the history of Romanian communism so important to me and whom do I hope to touch in writing fiction about it? An anecdote brought these questions into sharper focus. Friends of my parents, who have a son who’s not much younger than myself, told us that their son recalls only one thing about life under the Ceausescu regime in the mid 1980’s, when he was not yet a teenager. Now in his thirties, the young man remembers that as a child he frequently had to go to bed wearing his hat and coat during the winter, because there was no heat or hot water in their apartment. But he can’t recall much else about the hardships the Romanian people endured during the Ceausescu dictatorship. He knows only indirectly, from older family members and from history books, the childhood memories which I can still recall quite vividly, and which I wanted to depict for others in my writing. Conditions in Romania during the so-called “Epoch of Light” were notoriously miserable. People had to wait in long lines for meager supplies of food, clothing and household goods. There was limited heat and hot water. By the late 1970’s, the Secret Police had installed microphones in virtually every home and apartment. The whole population lived in fear. As a Romanian citizen said to a French journalist following the fall of the Ceausescu regime, “It was a system that didn’t destroy people physically — not many were actually killed; but it was a system that condemned us to a fight for the lowest possible level of physical and spiritual nourishment. Under Ceausescu, some people died violently, but an entire population was dying.” Although Velvet Totalitarianism focuses mostly on Romania, hundreds of millions of Eastern Europeans led similar lives to the ones I describe, struggling daily against poverty, hunger, state indoctrination, surveillance, censorship and oppression in post-Stalinist communist regimes. In actuality, “velvet” totalitarianism was insidious rather than soft and gentle, killing your spirit even when it spared your life. It’s one thing to read about the institutions and events that characterized life in totalitarian Romania and quite another to have lived through them. For my family and I, the events I describe in this novel are real. Like everyone else, we were subject to constant state indoctrination. Like practically everyone else except for the very privileged, we waited in long lines for meager supplies of food and consumer goods. Since my father traveled abroad, our apartment was bugged — we discovered hidden microphones underneath his desk and inside the heating units — and the Securitate followed my parents’ movements. My father worked at the Mathematics Institute. His boss was Nicolae Ceausescu’s daughter, Zoe Ceausescu, who actually went against some of her father’s policies by allowing him to go to scholarly conferences abroad. This rare privilege was essential to a mathematician’s — or, for that matter, any intellectual’s — career. Nobody can thrive intellectually without a free exchange of information and an awareness of the latest international discoveries in one’s field. In spite of Zoe Ceausescu’s umbrage, however, my father was accused by the Securitate of being an Israeli spy upon his return from a conference in Jerusalem. He was told that he’d no longer be allowed out of the country. No doubt this individual decision was not really personal. It coincided with Ceausescu’s national policy of closing the Iron Curtain, to further isolate and control the Romanian people. Fortunately, my father obtained permission to attend one last conference, at the Princeton Institute of Advanced Studies. He decided to take a chance and defect to the United States. Since my mother and I were still in Romania, my family struggled to reunite in the United States for nearly two years. Although there were precedents for similar immigrations, we lived under the rational fear that we might never see each other again. My mother was subject to demoralizing Securitate interrogations similar to the ones I describe in Velvet Totalitarianism. Yet, as I also depict in the novel, we never gave up or lost hope. Several congressmen and human rights organizations intervened on our behalf. When I was a few weeks shy of my twelfth birthday, we finally joined my father in the United States. “Velvet totalitarianism” is a term that has been used to describe the constraints imposed upon the expression of liberal values in the Canadian and American academia. Just as, conversely, the term “political correctness” has been used to indicate that there’s no real freedom of expression of conservative values in the academia. Indeed, whether or not America has turned out to be the country of plentitude and freedom that I dreamed about as a child back in Romania is another story. But what remains clear to me is that the systematic state repression we lived through in Romania makes whatever’s being criticized in Western institutions today, by both the right and the left, pale by comparison. The United States certainly lacks the absolute freedom that some of its ideologues may rhapsodize about, but what Romanians experienced was an absolute lack of freedom, which is far worse. In Velvet Totalitarianism I wanted to leave a trace of the scale of comparison, of the difference I experienced between the lack of absolute freedom here and the lack of any freedom there. As the narrator of my novel states at the end, I’m hoping that this description of daily life in Romania under the Ceausescu regime will convey to my children and to my children’s children — as well as all readers interested in this subject — the lost traces of an era in which ordinary people were forced to lead extraordinary lives. The anecdote my parents told me about the young Romanian who couldn’t recall much about the Ceausescu era helped convince me that these traces could, indeed, be lost. 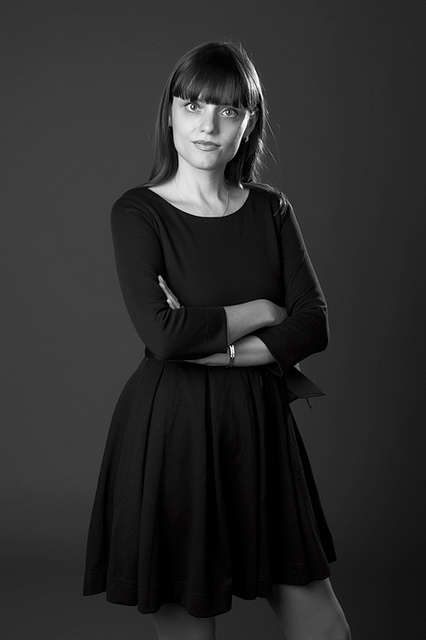 Due to the (largely positive) political and economic developments during the past 20 years in Eastern Europe and the internationalization of American pop culture, today’s children and young adults in Romania and other former East Bloc countries probably have more in common with their Western counterparts than they do with the family members who endured the hardships of communist regimes. Many of them know more about Facebook and Lady Gaga than about the Ceausescu era or the infamous Romanian orphanages. In writing about the communist epoch in Eastern Europe, both historians and writers of historical fiction are therefore helping preserve cultural memory for future generations of Eastern Europeans as well as for Western readers, both of whom are relatively detached from these experiences. They have not lived through them. They have no recollections that emotionally bond them to this difficult past. In many respects, the stark reality of Communist totalitarianism is as foreign to new generations of Eastern Europeans as it is to most Westerners. To offer one noteworthy example, if one looks at what’s being published and read about Romania in the U.S., one is immediately struck by the fact that it’s Vlad Tepes’s reign and the horrid yet tantalizing legend of Dracula that readers find most intriguing. Few Americans have heard of Nicolae Ceausescu and yet fewer know about Gheorghe Gheorghiu-Dej. Yet there’s hardly a teenager in America who hasn’t heard of the Twilight series; there’s hardly a bookstore in the country that doesn’t sell Anne Rice’s vampire novels or Elizabeth Kostova’s erudite rendition of the Dracula myth, the international best-seller The Historian. Why the Dracula legend has far more international appeal in the West than practically anything else related to Romania is a complex enough question to warrant numerous Ph.D. students, plus the Romanian tourism industry, working on it. Whatever the answers to this question might be, what’s become clear to me is this: for any author who writes about any OTHER aspect of Romanian history than the Vlad Tepes/Dracula legend, the challenge becomes, above all, how to make them matter to those who haven’t lived through those historical events and thus who have no a priori emotional investment in them. To begin addressing the question of relevance, I’d like to turn first to the nonfiction book that has inspired my novel most: Vladimir Tismaneanu’s Stalinism for All Seasons. For anyone interested in Romania’s political history during the twentieth-century, Professor Tismaneanu’s book is the seminal work on the subject. Clearly written, solidly researched, informative and engaging, Stalinism For All Seasons can be included among the best works of political history, alongside Richard Pipes’ works on Lenin, Robert Conquest’s books on Stalin and Allan Bullock’s studies of Hitler. It covers the evolution of Romanian communism from the early twentieth-century, through Gheorghe Gheorghiu-Dej’s Stalinist dictatorship and the latter’s strategic detachment from Moscow following Stalin’s death, to the dreary Ceausescu years of dynastic communism. Without this book, and others like it, younger generations of Romanians would grow increasingly disconnected from the past that deeply affected their families’ lives, and therefore, indirectly, their lives as well. To write about the history of totalitarianism, be it through nonfiction or fiction, means to undertake the task of preserving for future generations a cultural memory of social change, of trials and tribulations and of unspeakable human suffering. It means to take on the challenge of bringing this past to the attention of those who may not have lived through it, and who will not find it automatically relevant to their lives. It means to somehow make this strange and alien past matter to them, at least enough to awaken their curiosity and open their hearts. It means to pay homage to those who sacrificed, or were sacrificed, by the totalitarian machine. Writing the history of totalitarianism is therefore simultaneously a discovery of the suppressed truth; a eulogy to a difficult cultural past and its countless victims; an homage to the people who endured it and to those who had the courage to fight against it and a cautionary tale to all those who never want to experience it, or to live through it again. In this respect, political history and historical fiction serve similar goals and face similar challenges. They induce people to care about something that is either already behind them and that they may prefer to forget, or about something that they’ve never lived through at all. By way of contrast to political history, however, historical fiction isn’t as closely bound to accuracy or to any kind of objectivity. Of course, to write my book I consulted literally dozens of scholarly sources. But Velvet totalitarianism is also, above all, a work of mainstream literary fiction, to use one of the labels publishers rely on in this country. By this I mean that, by way of contrast to pulp fiction, the narrative style and the characterizations are as important as the plot and other structural elements of the novel. To make the main characters more multi-dimensional and believable, I relied for inspiration upon memories of my childhood and people in my life, especially my parents. But all the real-life elements of the novel served the function of enhancing and anchoring the fiction. The fictional elements, in my mind, were always primary. As a work of fiction rather than historiography, Velvet Totalitarianism also faces the principal challenge of entertaining potential readers. When I was writing this novel, I kept in mind the problem of how to present such dreary and disheartening historical information in a way that is informative without becoming didactic, and entertaining without trivializing the difficult past I’m trying to describe. I relied in part upon a literary precedent, a contemporary American novel I love: Jeffrey’s Eugenides’ Middlesex. Eugenides called his novel “a comic epic” (of his Greek-American cultural heritage). He went far beyond (and deeper than) ethnic humor, since his novel relies upon social and historical research, a traditional Aristotelian plot with tragic tension and an interesting twist, and characterizations that are plausible, endearing and humorous (also inspired in part by his family members). That’s what I tried to do in Velvet Totalitarianism as well, only for my Romanian-American heritage, of course. My novel has been described by critics as historical fiction, a spy thriller and a love story. All three descriptions apply equally well, but if I had to choose only one label, I’d say that Velvet Totalitarianism is a triple love story. First of all, love for two countries: Romania, my country of origin and its people, who have suffered a series of terrible governments and are struggling to emerge from them and establish a tradition of democracy. Simultaneously, love for my host country, the United States, the proverbial melting pot with a distinct identity that offers so many generations of immigrants the opportunity to flourish. Second, love for family, which gives the main characters the resourcefulness and strength to survive totalitarian repression. Third, the romantic love stories of fallible yet endearing characters who show that it’s our combination of faults, neuroses and loyalty to those important to us that make us fully human and enable us to enjoy the beauty of life, to survive its hardships and to overcome its challenges.